Habit: Plant hairy below; hairs white, sharply bent. Stem: branches generally several from base, 10--40 cm, gland-dotted above. Leaf: basal in rosette, +- gray, 1--2-pinnate-lobed, axis linear, lobes toothed on both sides, teeth short-pointed; upper cauline minute, entire or 2-toothed. Inflorescence: open; flowers 4--8; pedicels spreading, in unequal pairs, glabrous or gland-dotted. 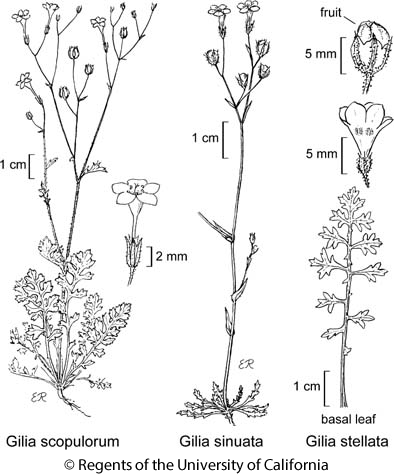 Flower: calyx 3--5 mm, hairy or glandular, glands black, stalked; corolla 6--10 mm, funnel-shaped, tube included or +- exserted, throat yellow with purple spots, lobes pink or white; stamens, style +- exserted. Fruit: 5--7 mm, <= calyx, widely ovoid. Seed: 9--18. Chromosomes: 2n=18. Citation for this treatment: J. Mark Porter 2012, Gilia stellata, in Jepson Flora Project (eds.) Jepson eFlora, http://ucjeps.berkeley.edu/eflora/eflora_display.php?tid=26929, accessed on April 22, 2019.